18.8% of Americans aged 65 and up — about 9 million people — report being full-time or part-time employees, according to a new report by Pew Research Center. By comparison, back in 2000, only 12.8% of those aged 65-and-up were working — about 4 million people. For the most part, these workers are men. Although men make up less than 45% of the over-65 population, about 55% older workers are male. Moreover, these workers are more likely to hold jobs in management, legal, and community/social service jobs than the overall workforce, and less likely to be food preparation, construction, and maths/computer jobs. Still, the most interesting thing about this rise in older workers is that it’s basically the opposite of what’s happened with the rest of the population in the US. The employment-population ratio of the adult population as a whole has yet to bounce back to pre-financial crisis levels. As of May 2016, the ratio was around 59.9% — below May 2008’s 62.5%, and May 2000’s 64.4%. 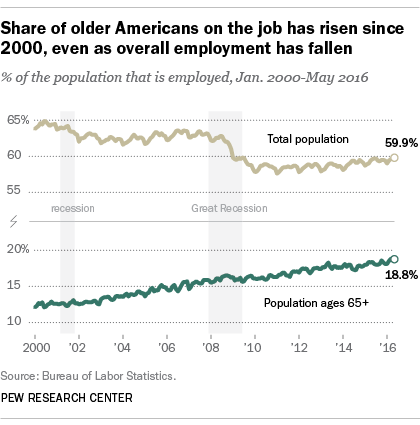 So, while more and more over 65-adults are working today compared to 16 years ago, the same can’t be said for the overall US population. Check out the full report at Pew Research.